Rountree Moore Toyota has always believed that the best new cars are used cars. Our pre-owned vehicles are perfect for people that want the dependability of a new Toyota for less than new. Every certified pre-owned Toyota is subject to a rigorous process. Each candidate for certification can be a current model year vehicle, up to and including 6-year old models, with 85,000 miles or less on the odometer. Every Toyota is given a 160-point inspection and the CARFAX® vehicle history report is reviewed to make certain that the car is up to Toyota’s high standards. When you purchase a certified pre-owned Toyota, you receive a 12-month/12,000-mile Comprehensive Warranty, a 7-year/100,000-mile Limited Powertrain Warranty, 1 year of Roadside Assistance and more! With over 3 million sales and counting, Toyota Certified Used Vehicles have cemented their place as one of the most popular used-car brands in North America. 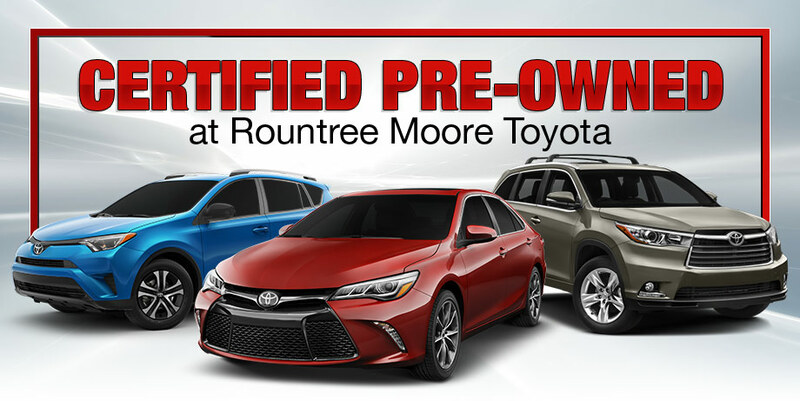 Visit Rountree Moore Toyota and experience them for yourself. We proudly serve the Lake City, Alachua, and High Springs, FL areas!